It has been my pleasure to read Summer Foovey's book; more than you can possibly know. Moving On is the story of Melanie, who sets out on an adventure in her kayak down the Equani River. Totally on her own, she leaves behind her friends and other comforts (well at least what we would call comforts) in search of...well...in search of herself. In the beginning, I didn't know what I was getting myself into as the author made it seem like the main character was not only saying goodbye to her friends and everything, but really saying "Good Bye". I kept thinking that something of irreversible proportions was going to happen, but it never did. And when I finally figured it out that nothing horrible was ever going to play out, I could finally relax and find the emotional connection that was calling out to me. Traveling down the river in PJ (her kayak), she says goodbye for one last time to places she's been and animals she has met. Weaving in flashbacks from her past, you see all of Melanie's pain, all her struggles, and every possible heartache she has had to endure. It's here on the river that she lets go of her past and allows the pain to float away; she becomes more relaxed and confident in her decision to move on with her life. When she stops to visit one of her favorite places, the home of one of the most elegant water birds, The Great Blue Heron, I began to realize why I had been drawn to this book. It was if I, and I alone, needed to read it. Sometimes a person's pain hides in very unusual places and then suddenly reappears for no reason at all, if only for the sole purpose of finally being released and let go forever. While I can truly say that I have never experienced any of the exact trials and tribulations that Melanie has gone through, I can, however, relate to some of the feelings. And as we see Melanie letting go of her past, I too, found myself letting go of my past, of my pain, with each turn of the page. I remembered things that I haven't thought about in so long. While it was troubling to relive some of these feelings, I knew that I had to in order to finally feel the wonderful cathartic release that had been so elusive in my life. Ms. Foovey's writing is raw, even graphic at times. I have to wonder if there is a part of her somewhere inside of Melanie. The only reason I say this is because I sensed a pain there, calling to me from the pages, that maybe wasn't even Melanie's, especially during the dialogs where Melanie offers the reader advise. Whether that was her intention or not, I hope that by the time Summer finished writing, she also found a way to "move on". 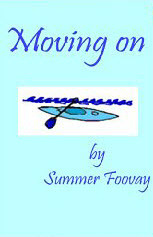 Summer Foovey's book, Moving On is available in an e-reader format and should be added to the top of your list. It's also currently in print under the title, The River Way.